Typical sanga phenotype, with long horns, large to medium in body size; tall at withers; small and cervico-thoracic hump; moderately developed dewlap. The Bahima are the tallest of the Ankole group of cattle, and they are the most susceptible of the Ankole to rinderpest and trypanosomosis. Coat colour is mainly dark red and light brown, and some are black, grey, dun white and pied. Until the conflicts of the Lakes region in recent decades, the Bahima had been free of zebu influence seen in the sanga of Ethiopia and the Sudan (Rege and Tawah, 1999). Maintained by the tribe of the same name in two areas that are separated by tsetse-infested territory. One of these is located in north-eastern Zaire and across the border in north-western Uganda. The second group is in southern Uganda and northern Tanzania. The original cattle were brought to western and southern Uganda by Hamitic tribes migrating from north-eastern Africa and possibly the Sahel in the 13th and 15th centuries. One theory states that the original Ankole cattle evolved around Ethiopian highlands (epicentre of Sanga dispersal) and the Bahima tribes brought them to northern Uganda (Rege and Tawah, 1999). 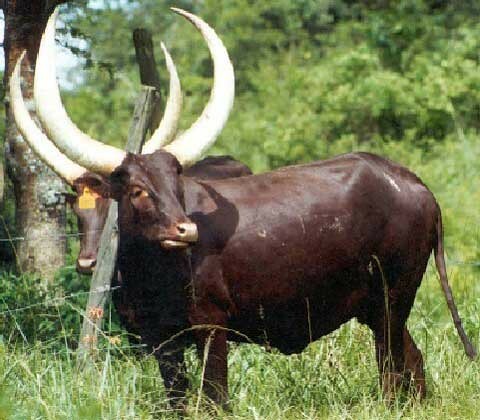 Another theory argues that the Ankole cattle with their characteristic long horns probably evolved around present-day Uganda, and developed further into the local strains of this sanga group (Felius, 1995).